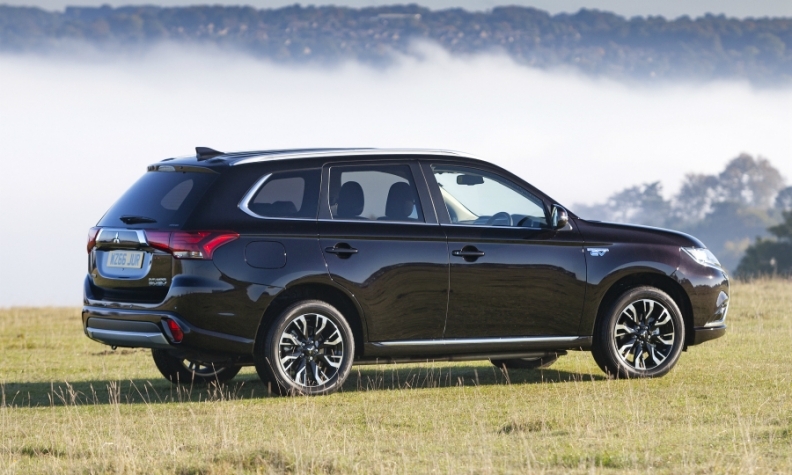 The Mitsubishi Outlander was Europe's No. 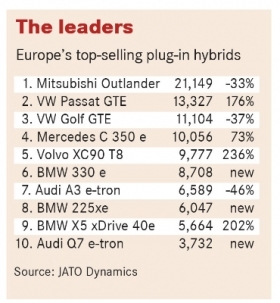 1-selling plug-in hybrid in 2016 despite a 33% decline in sales. Hybrid and plug-in hybrid sales grew an impressive 30 percent to just over 400,000 in Europe last year, but the real impact in the midterm will be made by a new, fuel-efficient mild hybrids that are cheaper and less complex than full-hybrid powertrains, according to analysts and automakers such as Volkswagen and Renault. By 2025 mild hybrids will capture 18 percent of the European market, IHS Automotive forecasts. That's compared with 6 percent for plug-in hybrids, 3 percent for full hybrids and 3 percent for full-electric vehicles in the same time frame. Currently, the big growth is in full hybrids, largely because of Toyota's increasing success in Europe. Expanding a technology that is enormously successful in its home market of Japan, the automaker last year launched hybrid versions of the RAV4 and CH-R compact SUVs, which joined gasoline-electric versions of the Auris compact and Yaris subcompact hatchbacks already on sale in Europe. Last year Toyota sold 232,699 hybrids across Europe, a rise of 47 percent from the year before, according to data from market researchers JATO Dynamics. Of those, 41,814 were the new RAV4 hybrid, putting it third behind the Yaris and Auris hybrid models. Lexus was the next biggest hybrid brand with sales of 41,372. Apart from minicars, Toyota is committed to offering hybrid variants throughout its entire range, Toyota Europe CEO Johan van Zyl told Automotive News Europe last summer. The automaker wants hybrids to account for half of its total European sales by 2020, up from 31 percent at the time of interview. Van Zyl said he expected 70 percent of C-HR sales to be hybrid. The car is not available with a diesel engine. Now that Peugeot is winding down its diesel hybrid program, Toyota's rivals for hybrid sales in Europe are limited to Kia and Hyundai, which last year launched the Niro and Ioniq compacts, respectively. The Ioniq is also available as an EV. Hyundai and Kia will add plug-in hybrid versions of both cars later this year, further expanding a market that now offers far more choice to consumers than either the full hybrid or EV segments. Plug-in hybrid sales in Europe rose by 19 percent to 112,300 last year as new models helped drive demand. Europe's best-seller by a wide margin was once again the Mitsubishi Outlander PHEV, which has been the region's leader in the fledgling niche since 2014. Demand for the car, however, dropped 33 percent to 21,149 last year as German automakers started to gain share in the sector. The Volkswagen Passat GTE rose to second from seventh in 2015 after sales climbed 176 percent. The Passat GTE also took advantage of a 37 percent drop for the former No. 2 in the sector, the GTE version of the VW Golf, which fell to third. Also, seeing strong growth in the segment were the Mercedes-Benz C 350 e, Volvo XC90 T8 Twin Engine, BMW 330e and BMW 225xe Active Tourer. Sales of plug-in hybrids in Europe have already overtaken those of full-electric vehicles and will continue to grow more strongly than EVs in the near term, IHS Automotive powertrain analyst Vijay Subramanian believes. But he warns the growth is precarious. The Netherlands was by far the biggest European market for plug-in hybrids in 2015, but last year the country slipped below the UK and Norway after sales halved. The collapse was because the government withdrew generous incentives for company car drivers on discovering from fuel-card data that drivers weren't plugging them in. Instead of reducing CO2 levels, the incentives were in danger of increasing them. Incentives are important because plug-in hybrids are more expensive than conventional models. In the UK, the largest market in Europe for both conventional and plug-in hybrids, the new Toyota Prius plug-in hybrid starts at 34,895 pounds [40,800 euros] before a 2,500-pound government incentive is applied. The Prius hybrid starts at 24,100 pounds. Despite the high purchase price, plug-in hybrids are popular in the UK and other markets because the current EU-wide NEDC fuel-economy testing cycle is very generous to plug-in models. The low CO2 figure it generates for plug-in hybrids make them eligible for attractive tax incentives. Those perks could be reduced if the forthcoming real-driving emissions (RDE) element of the revamped fuel economy test records more realistic figures. 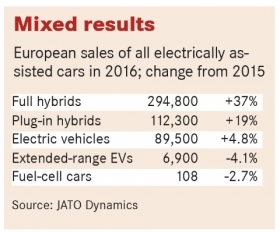 "The dramatic fall in PHEV [plug-in hybrid electric vehicle] demand in the Netherlands confirms how dependent they are on incentives," JATO analyst Felipe Munoz said. "The only real advantage they have is the incentive they can get." Automakers are responding by accentuating the other positives of plug-in hybrid models, such as performance. "It has this additional boost that comes on top of the gasoline propulsion that really gives you an edge. It's fantastic," BMW's board member responsible for the Mini brand, Peter Schwarzenbauer, said about the new Mini Countryman plug-in hybrid, the brand's first. The car uses a version of the drivetrain found on the BMW 225xe Active Tourer. Even so, Schwarzenbauer admits that adding the variant to the Countryman's portfolio is a gamble. "We have studied all plug-in hybrids and cannot see a clear trend. In some markets it's booming, other markets it's zero," he told Automotive News Europe at the Los Angeles auto show last November. Automakers and suppliers are clearer on the advantages of mild hybrids, which do not have the cost and complexity of full-hybrid powertrains. 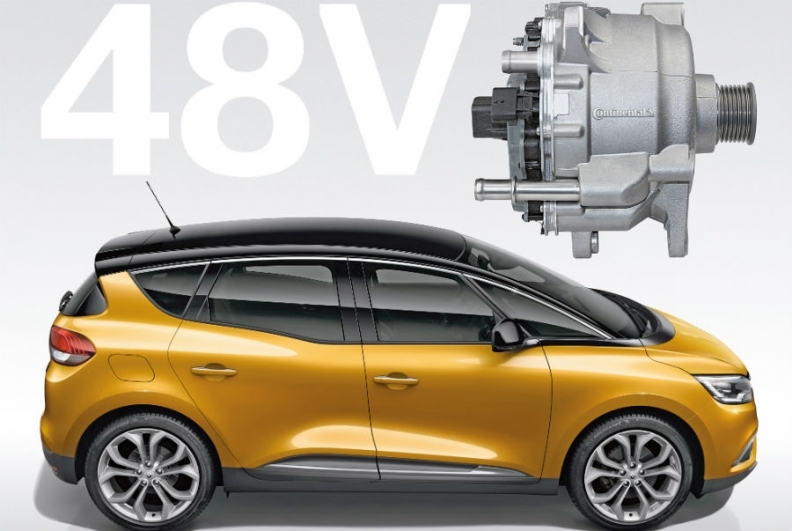 Renault will offer the Scenic with a mild hybrid system from Continental. In the first phase of the technology, a small 48-volt electric motor connects to the crankshaft to provide a low-cost power boost from a battery topped up with energy recovered during braking and deceleration. Renault is about to make a big splash with the imminent arrival of its first model with the technology, the Scenic Hybrid Assist. Renault will extend the technology from its popular minivan to the Megane compact model line later this year. The vehicles will use a 48-volt system from supplier Continental, which predicts the number of cars using these lower voltage hybrid drives will reach 4 million worldwide by 2020, rising to 25 million by 2025. Renault will use them on diesel models initially, but ultimately the technology will be applied to gasoline-powered cars to help reduce European automakers' dependence on diesels. VW believes the technology will remove the need for the smaller 1.6-liter diesel engine altogether. "In a time not so far away, people will go for petrol engines in combination with a mild hybrid,' Volkswagen’s head of research and development, Frank Welsch, told the UK's Autocar magazine in February. The technology is cheap enough to become mainstream, Continental's board member for its powertrain division, Jose Avila, told Automotive News Europe. "Typically a manufacturer says that an acceptable compromise for fuel economy versus cost is 50 euros per gram of CO2 savings," he said. "This technology gets very close to that." An earlier version of this story said the Suzuki Baleno and Ignis SVHS (Smart Hybrid Vehicle by Suzuki) offer 48-volt mild hybrid variants. Suzuki's SVHS system is a 12-volt mild hybrid.